Use an approved automotive paint respirator and WEAR safety goggles and gloves when handling automotive paint to protect your eyes and skin! Please read the information below for best results. Please do not spray our paint over enamel paint that is less than two years old. Clean the area (soap and water or wax and grease remover). Scuff the area well with wet and dry sandpaper. Check humidity (below 50%) and temperature (around 70F). Spray even wet coats of basecoat. You can sand the paint between coats, but don’t sand the final coat. Two wet coats should be sufficient. Allow each coat to dry 20 minutes before recoating. Some colors require more paint. Make sure the basecoat has dried thoroughly and then spray the clearcoat. Spray the clearcoat beyond the basecoat to a good stopping poinT such as the edge of the panel. Two wet coats should be sufficient. Let the clearcoat dry for at least three days. Use Rubbing Compound (apply with clean soft cotton only, paper products or dirty fabrics will scratch your paint surface) to smooth and shine the area. Always test the rubbing compound on your vehicle in an inconspicuous place to check for surface compatibility and shine. Without this step, the paint will not shine properly. If this is your first time, try one small area from start to finish before repairing other areas. Important! Make sure the temperature is at least 50°F but around 70°F is ideal. If you have had your vehicle painted at Maaco,or any other inexpensive paint shop within the last two years, our paint will lift your paint. If in doubt, you can paint a small inconspicuous part of the car and check for lifting. All spray cans are 12.5 ounces and provide excellent coverage of about six square feet (with two wet coats) so you can estimate how many cans you will need by measuring the square footage of the area you are painting. Blending the paint into adjacent panels will achieve a much nicer and less noticeable repair especially for metallic paints. The most important thing to remember is to not spray heavy coats. Do not apply so little paint that it dries as you apply it as this creates dry spots. Spray in a dust free area. Again, practice AWAY from your vehicle! Make sure you do not spray in wet or humid conditions! To test the humidity, spray some of the clearcoat and see how it dries. If it dries with a whitish haze or streaks, it’s too humid to paint! Spray paint should be applied when the temperature is at least 70°F and the humidity is below 50%. The first thing to determine is if the scratch has started to rust. We are talking about a surface scratch and not rust that is bubbling up beneath the paint, as this is too far-gone for touch-up paint! If the area is rusty, you should take a little extra effort to remove all traces of rust using 220 grit sand paper or a wire brush. Follow this with any of our rust conversion products and apply this to the bare metal. Just follow the directions on the product. We recommend the use of Adhesion Promoter if you are spraying a non-metal surfaces. After the area has been sanded smooth, apply a layer of Adhesion Promoter to the entire surface you will be painting (including where you will be applying clearcoat). Follow this layer with primer, basecoat and clearcoat. This product will promote proper adhesion of the paint layers. If you have an unpainted surface, either bare metal, plastic, rubber, etc., APPLY PRIMER! Primer is made to stick to unpainted surfaces and paint is designed to stick to primer! 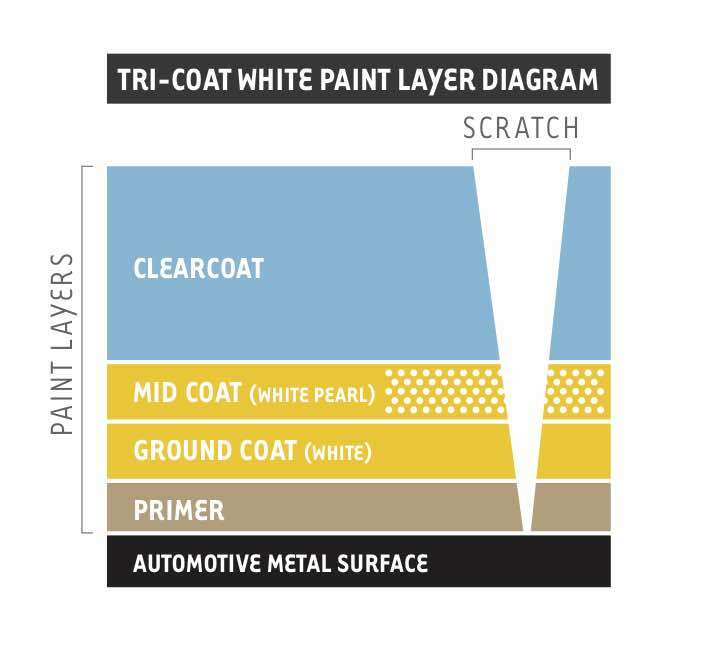 Professional automotive painters use lots of primer. You can spray our Rondex Etch primer over unpainted surfaces, existing paint (as long as you have sanded the paint) and over body filler. Use primer to cover small imperfections and to build up scratched areas to a smooth surface. For deeper scratches, we recommend a product called polyester putty available at our store. The putty is applied in several thin coats to slowly build up the surface. Use a final coat of primer over the putty. Primer has a tendency to shrink so let it dry according to the manufacturers instructions and apply several coats to achieve a smooth surface. You can let it dry overnight. A Flexible Primer is required on Flexible bumpers. Tape surrounding areas to protect against over spray. Use a tack rag to pick up any foreign matter on the vehicle. Spray even, overlapping coats. The painted area should be evenly wet with no dry spots. You can sand out imperfections later. Let the basecoat dry for approximately 20 minutes and then apply a second coat. Let the basecoat dry overnight and wet sand the area using 1000 wet and dry sandpaper to sand out imperfections, dust, etc. Spray a final coat of paint over the area but do not sand it. Let the paint dry thoroughly before applying clearcoat. You can let it dry overnight. For best results, metallic paints should be blended into the surrounding area. You are spraying the final coat and suddenly a big drip falls from the can right in the center of your work! Don’t try to wipe it off, you will make the situation worse. The best thing to do is just let it dry and wet sand the drip away and re-coat the area. Some of our customers have reported wrapping the spray can with a rag to catch any unforeseen drips. This even happens to professional painters so just be aware of it and check the nozzle and can for excess paint build up. Spray the clear over the paint. Do not spray the clearcoat in the sun. Do not spray a part that has been heated by the sun. Let it cool down first, as otherwise the clearcoat will dry with a dull finish. Let the clearcoat dry thoroughly. If necessary, wet sand out any imperfections with 1000 grit, then apply a final coat of clear. Let the clearcoat dry for at least three days and then use our automotive rubbing compound to smooth and shine the area. 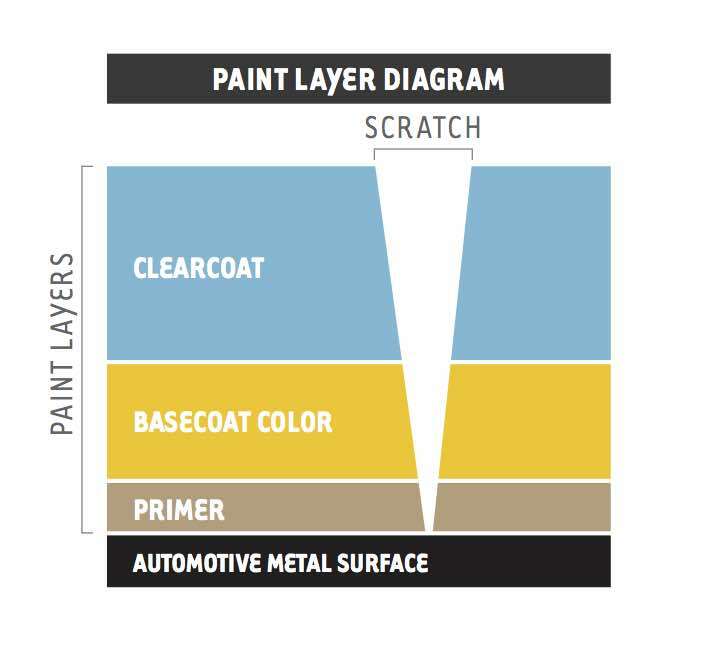 You would typically spray the clearcoat farther out than the paint to a boundary line on your vehicle. Again, you don’t want to spray the clearcoat in the middle of a panel without going out to the edges as you will leave a noticeable clearcoat line. The application of Rubbing compound creates the deep gloss in the clearcoat so don’t skip this step! Use a clean, very soft cloth like an old tee shirt (for example DO NOT USE PAPER PRODUCTS as the wood fibers will scratch the paint!). Place a small quantity of rubbing compound on the vehicle and use circular strokes and apply even pressure to the vehicle. It’s almost like waxing a vehicle except the rubbing compound is like an extremely fine liquid sandpaper. Buff with a clean cloth to a high gloss. (You may want to spray some paint and clearcoat on a smooth surface and practice to get the feel of it.) Sometimes lots of pressure is required to make the clear shine. The rubbing compound can also be applied by machine, but careful, it’s very easy to burn the paint! You can get the same results by hand, it will just take a bit longer. 5) You didn’t apply any clearcoat! Don’t laugh, but this has been a common problem. The basecoat will not shine no matter how much rubbing compound you apply. Solution-Apply clearcoat! Any color that has the word “Tri-coat” in the color description will need three different steps to achieve the correct color. You can use your own spray gun or purchase a Preval Spray Gun. If you choose to use the spray gun, you will need a small container of automotive lacquer thinner. Do not use regular lacquer thinner sold at Home Depot, etc. as it is the wrong kind. It must be automotive lacquer thinner. Do not use old thinner! If it is more than a couple of months old, use it to clean or prep, but do not use it to thin your paint. It will create a disaster on your vehicle! Both the paint and clearcoat must be thinned. Read the instructions on the can for further instructions.